This heavy-duty capsule machine can fill 100 size "00" capsules at a single time. Perfect for moderate users. Set the cap sheet on a clean, dry surface. Place the encapsulation sheet on top of the cap sheet using the stainless steel pegs to fix it in place. 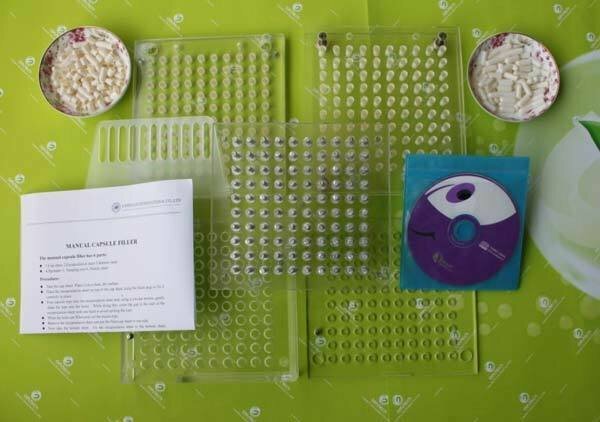 Pour capsule tops (caps) into the encapsulation sheet and, using a circular motion, gently shake the tops into the holes. When all the holes are filled with caps, pour off the excess. Remove the encapsulation sheet and put the filled cap sheet to one side. Now set out the bottom sheet. Place the encapsulation sheet on top of the bottom sheet, using the stainless steel pegs to fix it in place. Pour bottoms into the encapsulation sheet and shake in a circular motion to fill the holes. Pour off excess bottoms. Remove the filled bottom sheet and put it carefully to one side. Pour a scoop of filler onto the bottom sheet and use the spreader to fill the capsule bottoms. If the bottoms are not filled enough, use the tamping tool to compress the filler and repeat. Take the filled cap sheet and place the middle sheet on top using the pegs to fit it correctly in place. Turn the cap sheet / middle sheet combo over and set on top of the bottom sheet, aligned with the pegs. Place both hands on the top and push down with equal pressure across the sheet. Turn the whole set over. Push down again to lock the capsules.